The United States oil production continues to surge. There is a surge in production of light-sweet crude oil in the middle of the United States than there is refining capacity. We see that majority of pipeline projects are headed to the US Gulf Coast. However, Gulf Coast refineries prefer medium and heavy sour crude oil to light-sweet crude oil. The US East and West Coasts have excess refining capacity for light-sweet crude oil, which “shale oil” mining ultimately needs. Forecasts on “shale oil” production shows increase in oil production in the big three oil plays, namely Bakken, the Permian and Eagle Ford. In addition, there is rising supply from Tier 2 plays like Mississippi Lime, the Niobrara, and others. This production has overwhelmed existing refineries and pipelines. Investors are nervous of the major pipeline expansion projects scheduled to come on-stream in 2013, that it will intensely narrow MidCon crude oil discounts, commonly known as the “Brent-WTI” spreads. Pessimist analysts project a collapse to around $4-$5bbl, which is equivalent to pipeline tariffs from Oklahoma to the US Gulf Coast. Your Personal Financial Mentor notes: that is simply not true. That projection is a pessimist case that misses the reality that US Gulf Coast refineries are on the verge of receiving more quantity of light-sweet crude oil supply than they are geared to handle. The Brent-WTI projection for the year 2014 is $10/bbl. This forecast reflects the view that surging “shale oil” supply ultimately needs to head to the US East and West Coasts, which would cost about $10.bbl in terms of transportation costs. The Cushing centric view of those pessimist on spreads differs with the “East/West Coast” view of the MidCon infrastructure. The risk/reward to the update forecasts is bend towards a wider spread a long period of time since there are essentially very few pipeline projects on the docket to send “shale” oil supply to the US East or West Coasts. Chart 1: The US Gulf Coast will be awash in light-sweet “shale” supply, requiring a redirection to the East or West Coasts. 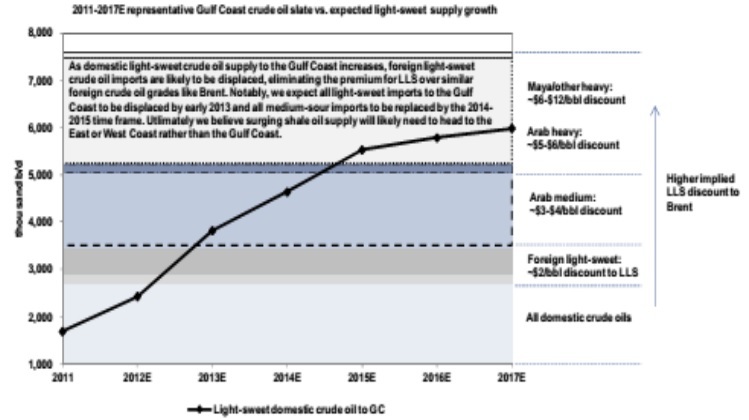 Chart 1 shows an updated outlook for the Gulf Coast crude oil balances. Light-sweet crude oil imports are on track to be fully displaced by 1H2013. There is potential for medium-sour imports to be displaced in the 2014-2015 time frame. The Gulf Coast is on track to be overcome with light-sweet “shale” oil supply. Thus, WTI prices are likely to stay at a wider discount to global crude oils like Brent since the supply ultimately needs to be redirected to the US East or West Coast. You cannot therefore consider the Cushing-centric, pipeline tariff driven outlook for Brent-WTI crude oil spreads as the relevant crude oil transportation cost. But look at the economics of shipping light-sweet “shale” from the middle of the country to the East or West coasts as the relevant consideration. The key risk to the outlook of MidCon crude oil discounts is suddenly lower realized oil prices in key “shale” plays. Oil prices will need to be generally above $70/bbl and preferably above $80/bbl for continued healthy oil supply growth. Global economic weakness or major transportation bottlenecks could weaken supply growth. This is a major risk to the updated crude oil spreads view. Another major risk is geologic disappointment that caused lower than expected recoverable resources in major “shale” oil plays. Domestic oil production has increased quickly that United States crude imports are falling at an accelerated rate. Even infrastructure is struggling to catch up such that using railways, trucks and barges to move crude has become common in markets. By the middle of this year, virtually no spot cargoes of light sweet crude may be imported by the Gulf coast refiners. Crude oil is coming on stream from worked-over mature fields in the Permian basin as well as from Texas to North Dakota. 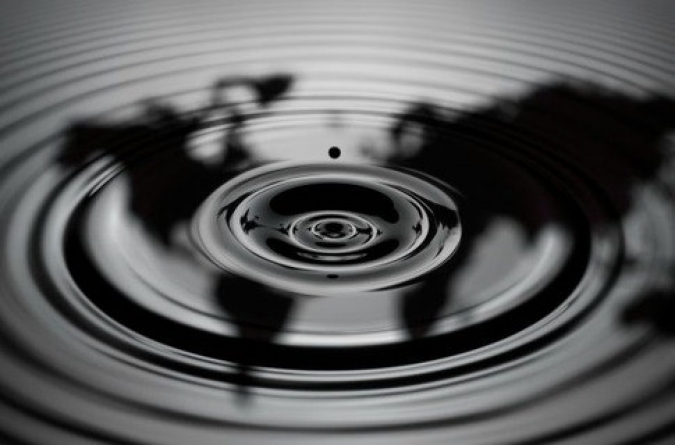 The light-sweet WTI crude benchmark has become disconnected from the global markets that crude oil sellers and buyers are having to execute transactions in creative ways to limit their exposure risk. “Shale oil” from the Eagle Ford shale formation has been moving to refineries by a combination of pipeline, truck, barge and rail. Oil produced in the area mainly moves by pipeline and truck to Valero’s nearby 95, 000 b/d. Crude oil production from the Eagle Ford in south Texas is expected to increase to 500,000 by 2015. North Dakota’s Bakken shale has experienced explosive growth that resulted in crude production so high that outstrips pipeline capacity to move the oil to refineries. Production in the MidCon exceeds regional demand from refiners. Bakken crude needs to avoid the risk of plunging to large and prolonged discounts to benchmark WTI since logistical constraints seem backing that up. The surge in shale oil production from the Bakken in North Dakota helped push WTI to a discount or more than $27/bbl to North Sea forward crude. Surging Eagle Ford output in southern Texas is likely to start pushing US Gulf coast grades lower comparative to crudes in the rest of the Atlantic basin. This trend is likely to continue as pipelines and other means of transport take increasing amounts of crude south from the midcontinent to the south Gulf coast market. Crudes from the US gulf coast have traded at large premiums to WTI. The nation’s dependence on foreign oil supplies wanes with the U.S shale boom, which has driven the cost of Gulf Coast light=sweet oil to its lowest compared to Brent crude in almost a quarter century. The sweet barrels in the Midwest need find a home, so they are getting to the market by trains, automobiles, you name it, even planes. The capacity to transport light-sweet oil to the Gulf coast from Cushing and inland shale formations is expanding fast. Infrastructure bottlenecks need to be cleared to allow crude oil flow out of Cushing as easily as it flows in. Light Louisiana Sweet (LLS) has emerged as a secondary benchmark for pricing light sweet crude in the US because an active futures swaps market in the US allows for hedging.